One of the perks of staying in downtown Wrightwood is that you can walk out of your hotel room and within a few dozen feet find yourself in the midst of downtown with a handful of small restaurants beckoning you with their yummy aromas. As it happens, around the corner from our hotel was a mexican restaurant that has an impressive 4.5 star rating on Yelp called Mexico Lindo, so we decided to check it out after an afternoon of enjoying what snow was left on the mountain. We spent a few minutes warming up in their tiny bar area while waiting for a table, then escorted up to the second story of what may have been a large home at some point. Mexico Lindo has the atmosphere of dining in someone’s home, or at least at one of those cozy Mexican restaurants you usually find in downtown San Diego or Los Angeles, with its large booths and walls covered in murals depicting the surrounding desert to mountains area. But it’s in the middle of a tiny mountain town next to Mountain High, so that makes it a pretty surprising find. For actual food, the little one got the kid’s taquitos with rice and beans, while we decided to share steak and chicken fajitas. We still weren’t learning our lesson in this town, despite the warnings of the Yelpers – the portions are HUGE. Fajitas for two is more like Fajitas for four, and the “child” portion is more like what I would expect to get as a regular entrée down here in OC. But man, was it good. The rice and beans were tasty, although nothing to write home about, and the steak was a little chewy, but the chicken! Oh, the chicken was prefect melt in your mouth, just like grandma (or at least my grandma) used to make it goodness. Especially when wrapped up in the warm flour tortillas, which were just thick enough to hold the chicken, rice, beans, some cheese, sour cream, and that amazing salsa without totally falling apart. So yum. The steak wasn’t bad, just a little tougher than I like, but we ate about half of that, because, well, I like steak fajitas, and those tortillas were really tasty. Then we were insanely full and talking about how next time we go there, we should probably just get the chicken fajitas for one and share. (I’m sure there will be a next time). Our end conclusion is that the Mexico Lindo quite deserves it’s 4.5 star rating, and I’d highly recommend it if you are in the area. 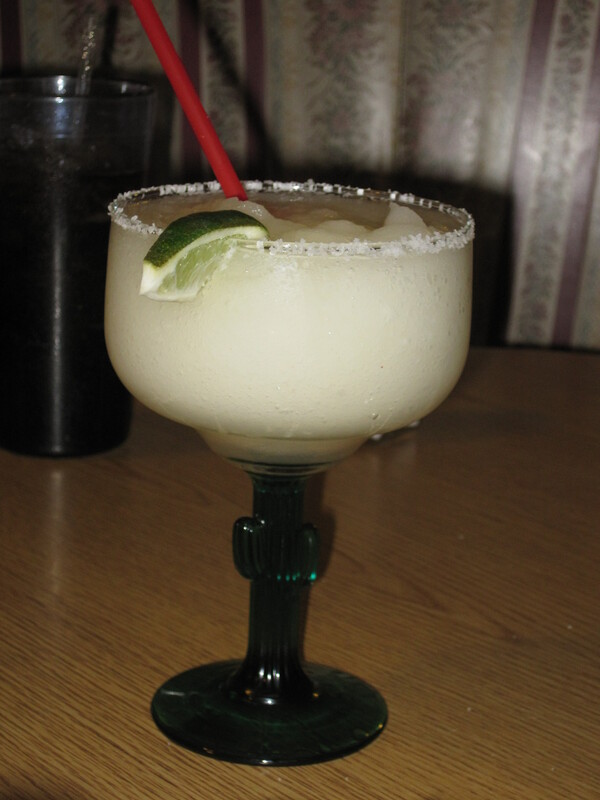 If you’ve got the cash to spend, I’d also high recommend the margarita, but if you’re just looking to fill your belly after a hard day in the snow, you can do quite well for under $20 here and probably have leftovers to take home. Is Mario’s the restaurant where you just order one drink and the waiter brings you an entire case of OJ? Speaking of you-know-who, he updated his blog recently. Good to know he’s not sounding terminally ill, at least.